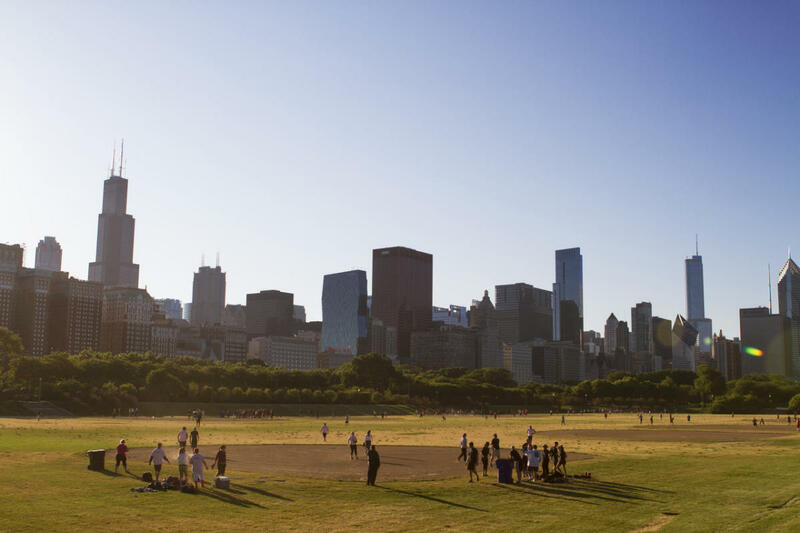 Proudly referred to as Chicago's "front yard," Grant Park is a public park, 319 acres located in Chicago’s central business district in the Loop Community area. Grant Park’s most notable features include Millennium Park, Buckingham Fountain, the Art Institute of Chicago and the Museum Campus. Named for United States President and Civil War General, Ulysses S. Grant, Grant Park was developed as one of Chicago's first parks and expanded through land reclamation. The park was the focus of several disputes in the late 1800s and early 1900s over open space use. It is bordered on the north by Randolph St., on the south by Roosevelt Road, on the west by Michigan Ave. and on the east by Lake Michigan. The park contains performance venues, gardens, art work, sporting, and harbor facilities. It hosts public gatherings, and several large annual events. Grant Park's centerpiece is the Clarence Buckingham Memorial Fountain, built in 1927 to provide a monumental focal point while protecting the park's breathtaking lakefront views. The park also contains baseball diamonds, tennis courts and plays host some the city's largest food and music festivals. The park has been the site of many large civic events. In 1911, it hosted the major Chicago International Aviation Meet. It was the scene of clashes between Chicago Police and demonstrators during the 1968 Democratic National Convention. Pope John Paul II celebrated an outdoor mass to a large crowd here in 1979. Championship celebrations for the Chicago Bulls were staged here during the 1990s. The park was the location for President Barack Obama's Election Day victory speech on the night of November 4, 2008. Annually, the park hosts some of Chicago's biggest festivals and spectator events including The Taste of Chicago—a large food and music festival held around the Independence Day holiday; The Grant Park Music Festival; and the park is also the site of the start and finish lines of the Chicago Marathon. Since 2005, Lollapalooza, a popular series of rock concerts has taken place in the park.